Tours depart every half hour from 17.00 - 22.00 March - October and from 17.00 - 21.00 October - March. The best time to take an evening cruise is between 8 and 9 pm summer time or between 6 and 7 pm winter time when the sun is setting over the canals and city lights illuminate the historic buildings. We are comparing Best Amsterdam Evening Canal Cruise Tour Prices from leading ticket suppliers and Try to find you Cheap tickets prices on the market. This 90-minute Evening Cruise is a magical sightseeing experience. Whether you're looking for a romantic evening for two or just want a unique way to spend an evening in Amsterdam. While on board you can pick up a drink and snacks at the bar then sit back to enjoy the views. Choose from a selection of wines or soft drinks or pick from a list of Dutch beers. If you want to learn a little about Amsterdam just select your preferred language and listen to an audio description. Hear about the city's history, forgotten legends and get some tips for restaurants/nightlife whilst cruising the canals of this iconic city. This scenic cruise will show you an alternative side of Amsterdam and a calming contrast to the city's bustling streets and alleys. This tour will appeal to people who want to see Amsterdam by night. The cruise will take a circular route through the historic centre so there's no need to worry about getting lost on the streets of Amsterdam. Ideal for couples but also suitable for families, friends and solo travellers. Your Experience With Best Amsterdam Evening Canal Cruise Tour? Cruise along Amsterdam's moonlight canals and enjoying the atmosphere of this UNESCO World Heritage City. Learn about some of the Amsterdam's most famous buildings and bridges. Pass the time with an informative and entertaining multi-lingual audio guide. Pass by old merchant's homes, charming boathouses and churches in the evening light. Visit some of Amsterdam's top touristic sights such as Westerkerk, The Golden Bend, Skinny Bridge, The Red-Light District and Anne Frank's House. 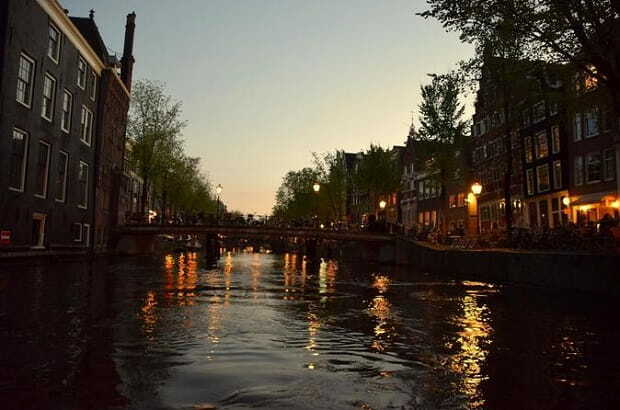 Enjoy the tranquillity of Amsterdam's Canals without the noise of daytime crowds. What Best Amsterdam Evening Canal Cruise Tour Includes? One ticket for a 90 minute Evening Cruise. Audio Guide in English, German, Dutch, French, Spanish, Italian, Portuguese, Russian, Polish, Czech, Croatian, Chinese, Japanese, Korean, Indonesian and Thai. The evening cruise can be very peaceful in during the winter when there are fewer tourists about but remember to bring a jacket for cold weather. Travelers Reviews about Best Amsterdam Evening Canal Cruise Tour? This is one of the best things to do on a visit to Amsterdam. The evening canal cruise has a 4.5 out of 5-star rating from TripAdvisor and Viator users. Get Your guide users have given this tour 4.6 out of 5-stars. Travellers agree that the evening cruise is a wonderful way to see the city even during the winter. You will need to bring either a printed ticket or electronic voucher when boarding. Tickets are refundable up to 24 hours before scheduled tour date, depending on the provider. Additional food and drinks or alcoholic beverages are available on board throughout the cruise. Hotel pickup/drop off is not included in the ticket price.